In 2018 the Marple Website celebrated an amazing 20 years online! This new web site was launched just before last Christmas, and is now a year old, but the Marple Website has been around for much longer than that and celebrated 20 years online in October 2018. The vintage web counter shows that traffic has risen significantly since the launch of the new site in December 2017. Page views have increased from 73,168 in 2017 to 183,461 so far in 2018. Unique visits have risen from 53,730 to 96,577 in the same period. The counter has been running since October 1998, when the original site was launched, and has now reached an incredible 1,342,658. These figures are for the main web site only and don't include stats for the Community Forum and Notice Board, which has so far received 427,421 page views and 190,433 unique visits during 2018. For those interested in details, here's a full record of the year's stats for the main site and the forum. Note: figures shown include up to 18 December 2018 only. Over 4 Million image views on the Marple Website Virtual Tour! As I write, the counter on the Virtual History Tour of Marple has reached 4,068,436 image views and there are now over 13,000 local photos shared. The images are from numerous sources over the last 17 years but key ones are Marple Local History Society's archives and the wonderful Arthur Procter, who continues to record just about every local event that occurs in Marple! Over 1,000 photos have been added to the Virtual Tour during the last 12 months and the total number of image views has increased a record-breaking 554,471 times since Christmas 2017. That's a growth of nearly 70% on last year's figures, so despite increasing competition from other photo sharing platforms, particularly Facebook, the Tour is more than holding its own! £12,000 donated to local causes over the last 12 years! From 2006 to 2010 the Marple Website donated £4,700 from sales of its Marple and Mellor Calendar. Since 2011 donations have been made from banner advertising and web design income. In 2018 the Marple Website has sponsored the Treasure Hunt in Memorial Park and the Street Poppy Appeal for £50 each, spent £155 on sponsoring the tickets for Open Gardens in Marple, donated £100 to Friends of Marple Memorial Park towards the new Ocean See-Saw in the Infants Play Area, and also donated £100 to Marple Carnival to help keep it going in 2019. Conscious that the running total of donations since 2006 was approaching the milestone figure of £12,000 donated in 12 years, four further donations of £50 have been made to local groups this Christmas, ensuring that this fantastic total was achieved. The beneficiaries of these donations are New Horizons, Friends of Rose Hill Station, Friends of Marple Station and Compstall Community Council. Hopefully a couple more £50 donations can be made to kick-off the New Year too! An average of £1,000 has been donated to local causes each year for the last 12 years! Thanks to the excellent support of the Marple Website's Local Business Sponsors, community donations are usually made from the income generated by advertising banners. A banner advert is a great way to promote your business and support your local community web site at the same time. There's also a sponsors' area of the forum that advertisers can use if they wish. The banners are available for local Stockport based organisations and businesses only, so if you're interested in promoting your local business on the site have a look here, and get in touch. Work started on this project in 2017 and involved a huge amount of planning and preparation by the organising committee. The Marple Website's main contribution was to create a series of pages on the web site that would promote the event and allow visitors to find their way to Marple and around the gardens during the weekend using interactive maps. This was a great success thanks to the platform that the new web site is built on. The event itself was an even bigger success, and the final count of money raised for Cancer Research UK was an amazing £13,000! The Marple Website is very proud to have been involved in this project, which was well supported by other local organisations and businesses too. Read more about the charity and local supporters here. Another project begun in 2017, it was great to see the new Town Centre Defibrillator installed and commissioned in May 2018, after a prolonged search for the most suitable location. This project was a team effort between Phil Cooke of Marple Bridge Association, Marple Civic Society and the Marple Website, and we'd like to thank the Regent Cinema for allowing the Defibrillator to be mounted on their building and Mike Beese of TBG Inspection Services for installing it. We also organised and promoted a training seminar at Marple Library for local people to learn how to use the Defibrillator in July. See more about the details of the project and learn how the Defibrillator was funded here. The Marple Website was delighted to help promote the sale of Chris Haigh's delightful book "Marple Through The Alphabet", which is raising funds for a number of different local charities. It was good to be asked to help promote the public consultation on Marple Neighbourhood Forum's Plan for Marple during the summer. It was important for this to reach the widest possible audience and hopefully more than 3,000 visits to the page set-up on the Marple Website and promoted via social media will have helped to maximise the feedback from local people. Many thanks for putting together such a superb article for the Lions on your website. The Marple Santa Dash, our tenth, was on Sunday and proved to be the biggest yet, with over 230 people taking part, 60 registering on the day between 11a.m. and 12 noon. I'm sending you some photographs and these few words but will put together a proper report when all our Christmas activities have been completed and we've been able to do our sums. At this stage, on behalf of Romiley and Marple Lions and Kidneys for Life, I would just like to thank all the wonderful people who turned out to support the event and the great team who come together every year to help us make the Santa Dash such a success. I include you in that team. Without the invaluable and much appreciated publicity you provide we would find it very difficult to adequately promote our activities. Thanks again. Have a great Christmas. Another "local project" the Marple Website has been very proud to support and promote over the last two years is the resurrection of the Marple Poppy Appeal. For various reasons the Marple team had fallen into decline. Jack Turnbull had taken over the lead role but sadly became ill and passed away in November 2015. Long term volunteer Ron Townley, who had organised the appeal on his own for well over 15 years was suffering from ill health and wasn't able to fill the breach left by Jack on his own, so the 2016 appeal suffered. Thankfully, in 2017 new volunteers Kevin Murray and Mike Openshaw joined Ron and together they have completely transformed the Marple Poppy Appeal. The results have been outstanding, with a record-breaking £15,237.43 raised by the 2017 Appeal and this record smashed again by the 2018 Appeal, which achieved an incredible £22,129.37. As well as these fantastic sums of money the team raised awareness of the appeal with their thought-provoking Street Poppies and "Who Was I?" campaigns. Very well done to organisers Kevin Murray, Mike Openshaw and Ron Townley plus everyone who helped in many different ways. It was a nice surprise to hear from a young writer called Ella Vanstone in October this year. Ella got in touch about about the possibility of gaining some practical experience in the field of journalism by contributing to the Marple Website as a volunteer reporter. Ella's first "assignment" was to attend a community meeting about ways to engage more volunteers to help support events like Marple Carnival and the Food and Drink Festival. She did a great job reporting on this and hopefully will contribute more on this topic and others of interest to the local community in the New Year. Helping to keep Marple Memorial Park looking its best! As most visitors will know, The Marple Website has strong links with Friends of Marple Memorial Park and it's been great to be involved with and promote so many of their great projects in the park. In August 2014 Friends of Marple Memorial Park began what they have called “Marple's WWI Timeline” on the railings of Hollins House in the park. The group's objective was to commemorate the Centenary of the First World War and to highlight the impact it had on a small town like Marple. In November 2018 this 4-year project was completed with the last of six permanent timeline panels being installed. The project was originally perceived as a temporary display running for the duration of WWI Centenary commemorations but it was so well received by the public that it would have been a great shame to take it down and remove the information about the Marple men who lost their lives. In 2018, with the help of Marple Area Committee and HB Printing, the temporary cards added since October 2014, and those still to come, were turned into permanent display panels that were erected in time for Remembrance 2018, 100 years after the end of the First World War. New plans announced last year to improve the top section of the skatepark and refurbish the existing basketball court, turning it into a Multi-User Games Facility, have dragged on for far longer than expected. The planning application submitted in December 2017 was not approved until October this year, the delays being caused by having to re-design following objections to the scheme. Good news is that £85K of Formal Sports Commuted Sums coming from the Hibbert Lane housing development has been approved by the council for this project. We don't know if this is enough to do the whole scheme but if not, it will certainly be a very significant proportion of it. Obviously once we know, and if there is a shortfall, we will look for ways to raise any extra money that is needed. Progress now depends on tender and procurement activities in the hands of the council. Every stage of the project is taking far longer than expected but we hope to have more news in Q1 of 2019. The Julian Wadden Family Treasure Hunt in Memorial Park has become a regular fund-raising fixture for Friends of the Park over the last four years. The event has gone from strength-to-strength, raising £400, £940 and £1,450 respectively over the first three years. 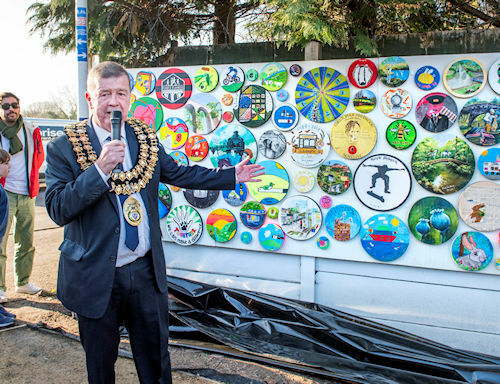 This money helped to fund the phase I skatepark project completed in 2017 but the £2,154 raised in 2018 was put towards new equipment in the Infants Play Area. 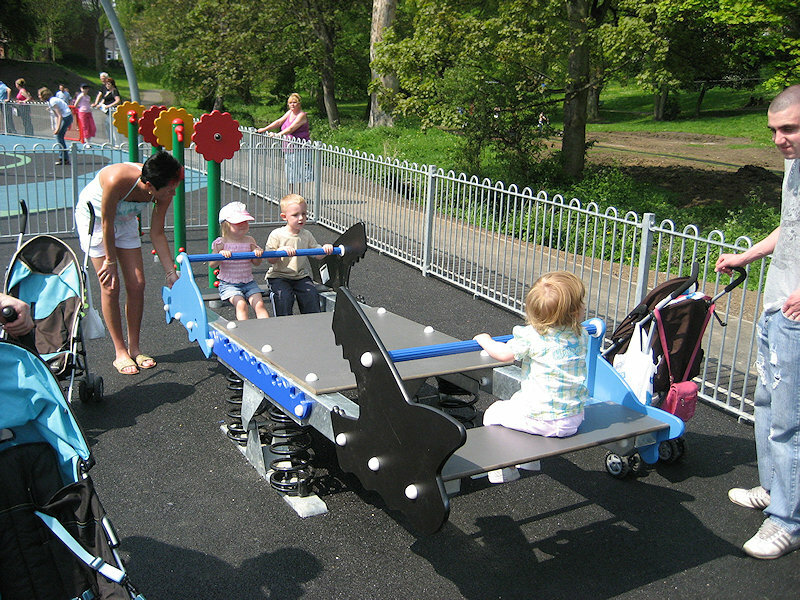 This was an Ocean See-Saw installed in the space alongside the swings. The total cost was £5,570 and the Treasure Hunt funding was boosted by a grant from the Auto Trader Community Fund, contributions from the council, Friends of the Park and the Marple Website. Visit the Friends of the Park web site to learn more. Thank you to Arthur Procter for his fantastic support of the site! Local photographer Arthur Procter continued his wonderful support of the site in 2018 and has shared his photos of local events in and around Marple. 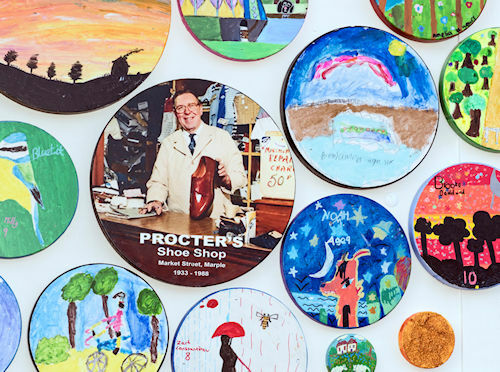 Arthur's great contributions this year include: Launch of the Treetops Exhibition in Marple Library, Hawk Green Maypole Event, Friends of Rose Hill Station Art Project, Marple Carnival 2018, Mellor Country Fete, Open Gardens in Marple, Mellor Mill Fact and Fun Day, Marple Food and Drink Festival, Rose Hill Intergenerational Art Project Launch and Marple's 2018 Christmas Events. Arthur was away in London at a special service in Westminster Abbey for this year's Remembrance Service in Memorial Park, so keen photographer David Burridge and I had to step in to cover this important event. Thank you to David for doing this, and also to Jake Taylor, who once again shared his excellent photos taken during Marple Carnival with the Marple Website.